. This is a status placed upon roofing contractors who have taken and passed a test to measure the level of roofing knowledge their project managers possess about the roofing installation process. 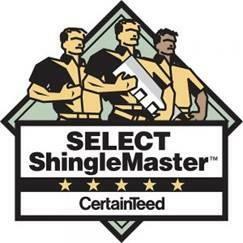 Unlike other shingle manufacturer’s certifications, the Shinglemaster is awarded only to contractors who have demonstrated proficiency in both roofing installations as well as client satisfaction. CertainTeed mails out satisfaction feedback surveys to our clients, and if we do not maintain an acceptable level of client satisfaction, we would lose our status as a ShingleMaster. Currently, 11 of our clients have completed and returned their surveys to CertainTeed and we are maintaining a perfect 5-Star rating. In October, 2017, Tracy Bookman, Homestead Roofing’s owner, took, and passed CertainTeed’s Business Fiscal Responsibility test. This test is designed to determine whether or not a contracting company’s owner is following best business practices, so CertainTeed can gauge the likelihood of that contractor staying in business. Also, our roofing foreman and one of our installers took and passed CertainTeed’s Shingle Applicator’s test. By maintaining a high level of client satisfaction (based on the survey results), engaging in sustainable business practices, and by having project managers, foreman, and installers who know how to correctly install the CertainTeed line of products, Homestead Roofing was recently awarded the Select ShingleMaster certification status. Not only does this put us into a more elite group of local roofing companies – there are only 5 Select ShingleMasters based in Colorado Springs – but it enables us to provide additional warranty protection to our customers who choose to upgrade or install Class 4, impact resistant shingles and the Integrity Roofing System. We’re proud of our close association with CertainTeed and excited to have earned their trust to move to this level of our business.